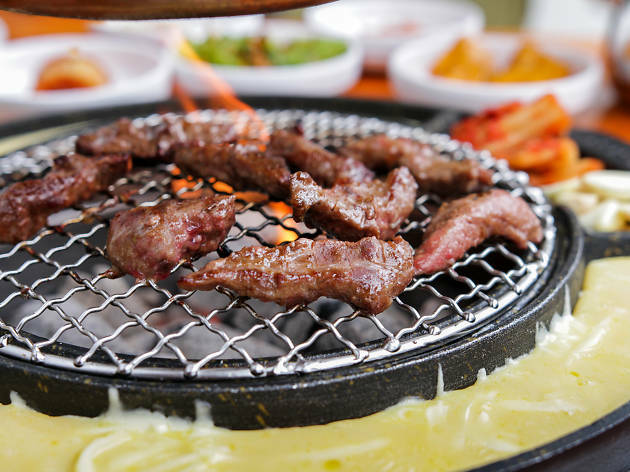 Plaza Singapura joins 263 other addresses in Korea, China, Hong Kong, Japan and Indonesia to house an outlet of made-in-Seoul Korean barbecue restaurant, Seorae Galmaegi. The magic of this tableside grill joint with a vintage '70s vibe is in its name. Galmaegisal, a slim pork skirt cut ($21.90-$29.90/original, $22.90-$31.90/spicy, $22.90-$31.90/garlic-soy) found between the ribs and belly of a pig, is said to have been reserved for the country's royal family in ancient times, but is laid out here – after a steep in Korean spices – on charcoal-heated grills for us non-nobles. 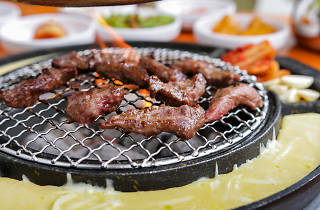 Other cook-it-yourself meats on offer include beef and pork cuts, while a metal moat around the fire melts cheese to have with your meat.